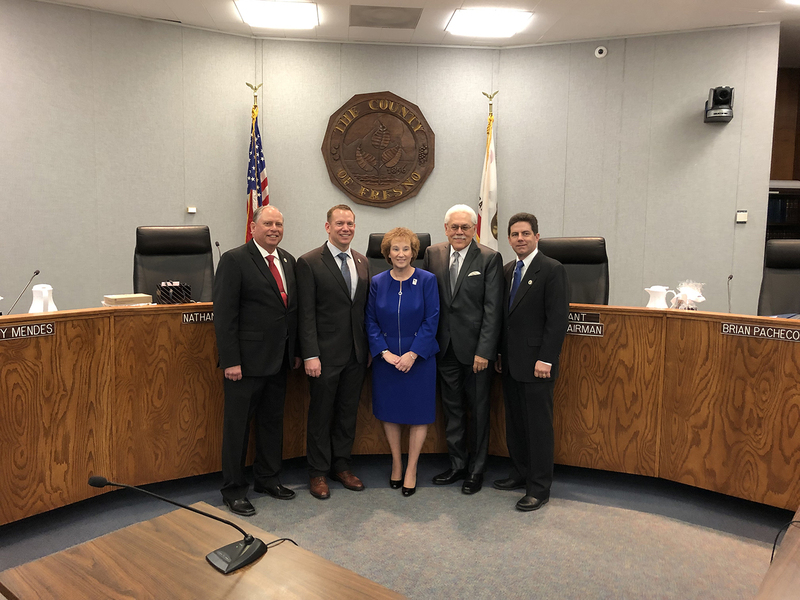 On Jan. 8, 2019 the Fresno County Board of Supervisors marked their first meeting of 2019 with the designation of Board officers and the swearing in of elected officials. District 5 Supervisor, Nathan Magsig, was named Chairman through 2019, while District 4 Supervisor, Buddy Mendes, will serve as Vice Chairman. The roles of Chairman and Vice Chairman were held in 2018 by Supervisors Sal Quintero and Andreas Borgeas, respectively. The roles of Chairman and Vice Chairman are served in 12-month terms, rotating annually between Supervisors. In addition to the designations of Chairman and Vice Chairman, several elected officials were sworn into office. Supervisor Mendes joined with fellow Supervisor, Brian Pacheco, and County Clerk/Registrar of Voters, Brandi Orth, in taking the oath of office for their respective positions. All three were re-elected in the June 5, 2018 midterms. This is the second elected term for each. Supervisors Mendes and Pacheco were first elected to the Board of Supervisors in 2014. Orth was also first elected in 2014, but has served in the role of County Clerk/Registrar of Voters since 2012 when she was appointed to fill the position vacated by her predecessor, Victor Salazar.